Geofencing is one of the more notable additions; users can also assign multiple lights to rooms, so that all the lights in a room can be controlled at once. 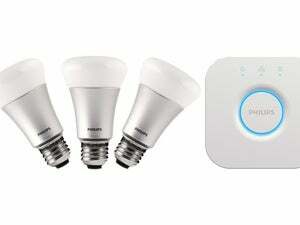 Philips has announced a new app for its Philips Hue gen 2 smart LEDs that gives users more fine-grain detail control over their lighting. It includes one of the most user-requested enhancements, according to Philips: the ability to assign multiple lights to a room, so that all the lights in the room can be controlled at once. Users will also be able to program daily routines, and use geofencing to automatically turn lights off when they leave the home, and on again as they return. The app’s dashboard provides easy access to Hue’s most popular features. Users can select a group of lights and assign them to a room, which then can be activated by voice or within the app itself. Uttering a command such as “set living-room lights to 50 percent,” for example, will bring all the controlled lights in the living room to half brightness. A new Routines feature, meanwhile, lets you program your lighting for your daily activities, so that you always have the appropriate light for waking up, reading, relaxing, or getting motivated to work or exercise. . So you can program specific Hue bulbs to turn on to preset brightness levels and color temperatures to help you wake up or fall asleep. A new geofencing feature called Home & Away uses your location to automatically turn off your lights when you leave, and turn them back on again when you return home. Finally, Philips has rethought how its lights can be used to create custom color combinations to match or complement the colors in the rooms they're installed in. While you've always been able to change the colors of Hue bulbs, the app can now be used to extract the right colors from a photo of your room to eliminate the guesswork. The impact on you at home: If you're a Philips Hue owner, Philips just added a whole lot of functionality to your lighting-control system. Users have been requesting some of these new features for a very long time, and now many of them will finally be available via upgraded apps from the iTunes App Store and the Google Play Store starting on Thursday.